Winter is here in the northern hemisphere and our friends at Simple System have shared their feeding advice to keep our horses happy during the colder days. Make sure your horse always has forage available to eat. Horses generate their heat through fermenting forages, such as hay, grass and Lucerne, in the hindgut. By ensuring your horse has enough hay to eat, you will keep them warm in the coldest weather. Instead of feeding your horse once a day, try to split feeding times to two or even three times a day (if possible!). Horses are used to eating pretty much constantly. Monitor your horse’s water daily to ensure he is drinking enough and staying hydrated. Break ice on frozen water troughs – and a cheap colander to sift out chunks of ice – and add in a little hot water to tempt your horse to drink. Soaked forages, such as grass pellets, are a great way to hydrate your horse, as well as giving him a nutritious feed. Check hydration by doing a pinch test – a pinch of loose skin on the shoulder should immediately spring back when you let go. If you are giving your horse hay in his field, split it into two or three piles spread evenly apart. This will encourage him to move around and forage for his feed naturally, as he would in the wild. Constant movement will keep your horse exercised, healthier and will help keep his joints in good condition. Enrich your horse’s environment to keep him occupied in the cold weather, particularly if your horse is stabled for long periods of time. Our own MeadowBrix are great boredom busters; these are 1kg blocks of compressed grass and the horse has to gnaw and chew on them, mimicking natural grazing. You can feed them in the stable or the field. You can also give your horse a nut ball with grass pellets in. Tis will keep him occupied and encourage trickle feeding. As a treat, cut up pieces of carrot or apple into batons and hide them in your horse’s hay. Be sure to always feed your horse at or at least near, ground level. Horses evolved as grazers for 30 million years and their back, teeth, neck and lungs are all adapted to them eating with their head down. For more advice on winter feeding, please contact our Feed Line on +44 (0)1728 604 008 or email info@simplesystem.co.uk. Photo credits – lead photo Vineyard Arabians, Slovenia. 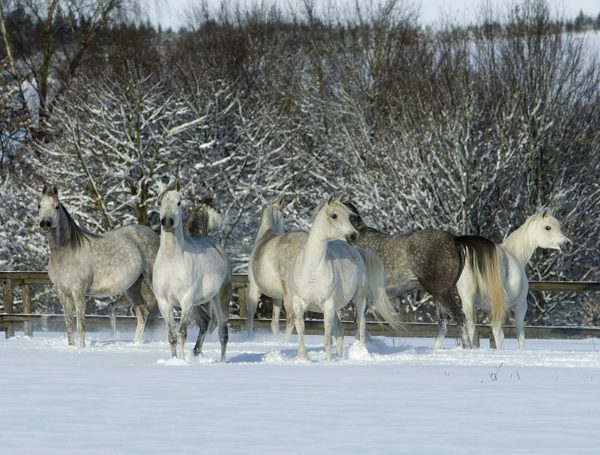 White mares in the snow – Sax Arabians, Germany.